PVP Changes Live Now! Celebrate with 2x Scrolls &amp; Let Us Know What You Think of the Changes! The PVP changes are now live! To celebrate, there will be 2x Scroll drops in PVP for the next few days, and the top finishers in the current tournament will win Phenol Thoxian tokens. In addition, Torchy is being featured in the Great Portal, and Ekko, Indigo, and Yokozuna are being featured in the Heroic Portal. Try some raids and let us know what you think of the PVP changes! We really appreciate your feedback. 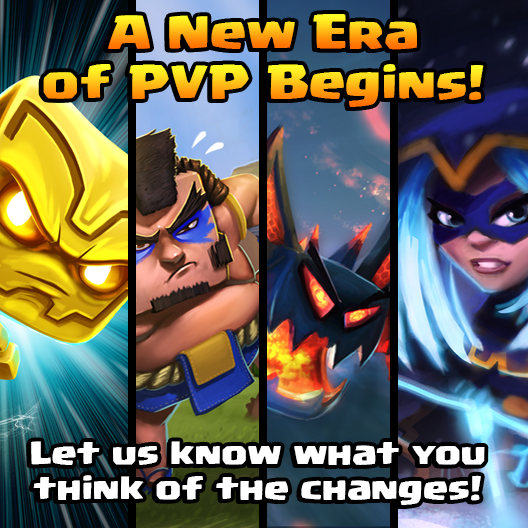 In case you missed the announcement of the PVP changes, you can read all about them HERE. Sweet! Ekko is the new PvP king! Nice with new PvP changes. A bit sad there is no PvP event quests, coulda been a 5/10/15 win pvp quest or something at least to be honest. Light and Dark toons only have resistance toward their own type. I.e. No one has resistance to lightening but light toons. If only Ekko were a caster then he would dominate! We always love the feedback. Leave it all here but please keep it to just PVP changes feedback as much as possible. I will be watching this thread quite a bit so there is no need to @ me either! @Greg What about guild changes? thought they were coming with this update! I think I have changed my defensive linup 5 times in the last hour... and I haven't even been attacked yet. Definitely gonna shake things up for awhile. I'm not seeing the 2x scrolls in PVP either announced as an event or in effect when looking at PVP rewards. Edit: Restarting the app caused the event to trigger. If Ekko were a caster, Ekko on Ekko battles would like never end lol. So far I'm liking the changes. I'm playing through my second account at a low level (lvl 21), so these comments don't apply so much to lvl 61 pvp. 1) I'm really liking Torchy and Indigo changes. Now instead of trying to kill igorok/bovus with rogues, I silence them and buy myself a round. This is better game play than Willow/SB assassinations imo. 2) The matches are only a bit longer (2-3 rounds, instead of 1-2), but much more fun. 3) I still haven't found casters too threatening when placed on defense, as killing them early still seems to be very easy, even with the 40% boost... but need more time to tell for sure. I'd still love to see Blacksmoke give some sort of defensive boost to casters (e.g. give him +hp passive or having him absorb a % of hits to casters as passive), this would make them more usable defensively. 4) For offensive raiding, casters are kicking ****. I do notice more damage coming from them. 5) I'm finding few ekkos in the defenses, so Bovus is still rocking it for me. Maybe this will change in time or at higher levels. Either way, I don't think Bovus was nerfed like others are saying, more just given a counter. I guess the question is whether in 2 months time will the forum be full of "sick of the same old Torchy/Ekko defences in PvP and Tower" posts? Level 31 - and leaving the game. Thanks to undesirable changes in the game. So far I'm liking the changes. I'm playing through my second account at a low level. I'm really liking Torchy and Indigo changes. Now instead of trying to kill igorok/bovus with rogues, I silence them and buy myself a round. This is better game play than Willow/SB assassinations imo. Let's just pretend for a minute that the changes are the other way around (i.e. the way PvP is now is the way PvP used to be, and they just removed Torchy and Indigo's silencing abilities). "Instead of trying to silence IGOROK/Bovus with rogues, I kill them with Willow/SB and buy myself a round. This is better game play than Torchy/Indigo silences imo." Not meant at you personally @4tom - lots of people are getting excited about this and I'm just trying to make the point that maybe why this is "better" now is arguably only because everything is new. Before we had... must kill Bovus/IGGY, now we have, must silence Bovus/IGGY. The health changes will certainly shake things up a bit, but in terms of the Bovus/IGGY situation, all we've done is traded assassination for silence. We never said this was our update, these are just some PVP changes. With the upcoming changes, Magical resistances (FIRE, WATER, NATURE, SPIRIT, etc.) will no longer scale with SKL and/or level increases. They will also no longer mitigate over-time effect damage. -Resistance now begins at 30% for the hero’s element and 15% for the opposing element. These will now increase just a tiny bit with star increases. -All other resistances, besides spirit damage (3%), stay at 0% and no longer increase unless the hero has a passive that increases them. I'm seeing that Spirit resistance is 5% for my heroes at level 35. Was the 3% wrong or does Spirit resistance go up a little with level/stars? In terms of the Bovus/IGGY situation, all we've done is traded assassination for silence. (1) Assassination removes the hero from the game. If you use Shadowblade and Willow to kill Yoko, Yoko is dead and you can deal with the rest of the team. If you silence, Yoko is still alive and going to use his ability in the future unless you deal with him. (2) Assassination usually required 2-3 fast heros, so your options for team set-ups were pretty limited. Silence requires one fast hero. (3) Silence might get used defensively more. Not sure about this one, but I suspect you might see Indigo on defenses with the idea that her first attack is likely to target any Torchy (thus preventing Torchy from silencing back). So perhaps there will be a defensive counter to silencing. These aren't necessarily sweeping changes. They're little shifts, but positive shifts towards more dynamic fights I think... but yea it's a bit early to tell exactly where we'll be in 2-3 months. Not true at all, we have added silence as another PvP option. This will open up the metagame, and we'll see more variety. Loving the changes. Does feedback include changes we'd like to see about PvP as well? Things that should've or could've been implemented also? Ekko is not even a factor in the new silent world. Well, Indigo is viable now, Torchy got a buff that honestly, he needed as his 2nd ability was completely useless other than being an enhanced basic attack every few turns. Kinda wish they added a stun chance to smack down now, since it's basically a glorified basic attack too. Anyone notice the reduced cooldown of Sumo Stomp allows Yoko to do it once before and once during Taunt? Check out my Kill Quest chart here! See my guide to the Tower of Pwnage here! @JackHallow666 I really dont feel like Torchy needed buff to begin with. There are a ton of characters who'd I think to buff before Torchy. Torchy was already the only fast character to have a his second ability charged going into the second round, and I feel like Lockjaw already did a pretty decent amount of damage. Don't get me wrong the round 1 silence makes him amazing, but I think you're selling pre-update Torchy a little short. I think you've made it really, really easy. Are you sure you guys tested this thing for balance before putting it in? I think there should be changes to the energy. With the battles lasting longer, the defense has access to all the abilities, which they are able to unleash on the 2nd and 3rd rounds, compared to the offense who usually can't survive long enough to use their second and third abilities. The defense already gets the initiative advantage by being able to attack first. To even things out, I think the second ability should be available to offense on the 2nd round, and the third ability should be available on the 3rd round. One of the reasons for the change was for people to be able to use more abilities. Right now it seems that benefit is only available to the defense since all their abilities are charged and ready to go. Still early, so I'll reserve final judgment until I've played more battles, but that is my first impression. I think there should be changes to the energy. With the battles lasting longer, the defense has access to all the abilities, which they are able to unleash on the 2nd and 3rd rounds, compared to the offense who usually can't survive long enough to use their second and third abilities. The defense already gets the initiative advantage by being able to attack first. You are forgetting one major point in PVP, your mind. As the attacker, you have the advantage to pick a tailor-made team to counter the defenders. You can come up with a tactic while the defenders have a 'stupid' (not saying it's bad, just not as good as a human mind) AI that hits Tsume down to 25% to keep it there and have Willow Sniper Nimriel instead of Yoko. devs increased HP to let us have fun and have longer battles, but they end up with much quicker battles. what a fail. Agree that is the offense advantage -- just not sure it is enough to overcome the initiative and fully charged ability advantages on the defense side. Time will tell. I had a battle where I used all my first round abilities but couldn't quite finish off the defense. After that it was hopeless as I had to auto attack while the defense unleashed all his other fully charged abilities. My bovus was auto attacking while the defense was able to use both is 2nd and 3rd abilities. Seems unbalanced, but we'll see. It is a great idea to try to lengthen the battles, but that really only helps the defense as the battles aren't long enough for the offense to actually use the other abilities, while the defense can. So one of the goals of the devs (for people to be able to experience more rich battles) doesn't really seem possible, unless they consider watching the defense use all its abilities while you auto attack to be a "rich" experience. Agreed. No slow defending hero has gotten to even attack back at me yet. All my attacks have lasted one round. I have used the same four heros for every attack. I was very much hoping for much stronger defense, variety of hero use and the need to use my understanding of the game to compete. I'll give it some more time before I say fail but I'm disappointed so far. I went to tower of pwnage and my undead team got wiped out by the enemy ignus, my zomm took 2000 burn damage, safe to say things got really chaotic really fast. First thoughts and feedback is that attackers have more of an advantage now. Silence followed by crowd control like bovus, yoko, igo pretty much decides the fight. I dont think theres a defense i cant win against anymore.